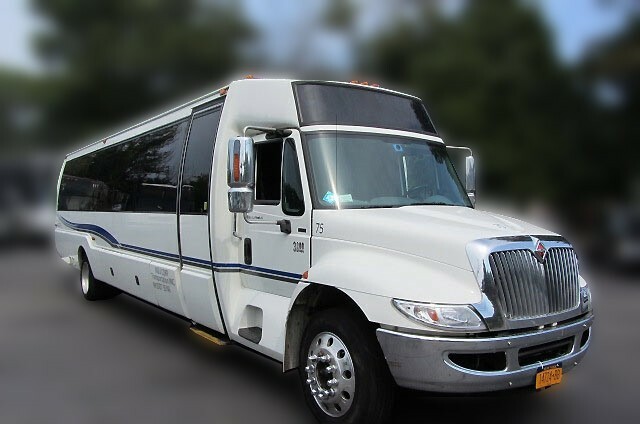 M&V Limousines Ltd. and MV Corporate Transportation is the industry leader when it comes to a coach bus rental or a charter bus rental in Long Island, New York City, Brooklyn, Queens, Bronx and New Jersey. Our luxury coach buses can up to 56 passengers. 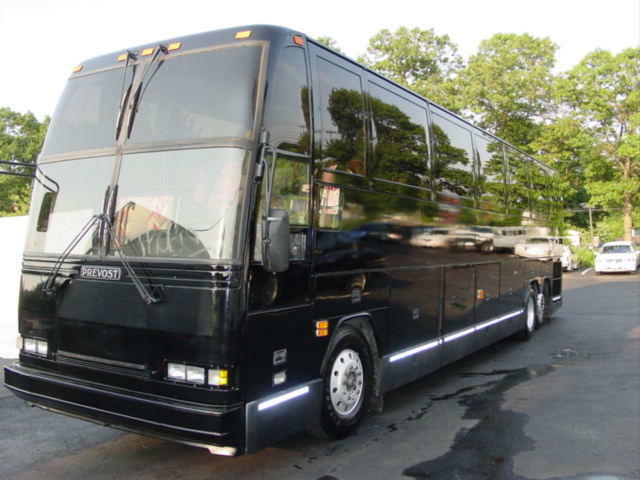 If you’re looking at charter bus companies, allow M&V Limousines Ltd. to serve you. M&V Limousines Ltd. offers the latest in coach buses for weddings. 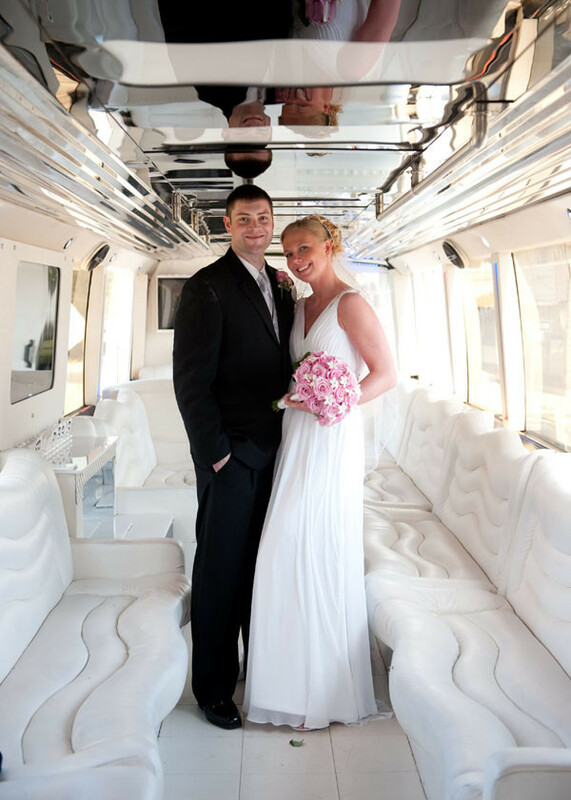 If you’re looking to provide a wedding shuttle for your guests, trust that we’ll transport everyone safely and on time. M&V Limousines Ltd. offers the latest coach buses available. Everything from the latest Prevost and Mercedes Setra coach buses. We will make sure that all of your guests are transported safely from the hotel to the ceremony, and then to the reception location, and then back at the end of the evening. Everyone can have a good time and not have to worry about driving, allowing them to celebrate with a clear head without the worry of how they will get home when the party’s over. Having a charter bus or a shuttle bus is also very helpful when you have out of town guests because they do not know the area. The usual shuttle time frame from start to finish is about 8 hours but we can customize a package if your time frame is longer or shorter. When you rent a coach bus from M&V Limousines Ltd. you also have the peace of mind that your driver is a professional chauffeur because we are not only a bus rental company, but a full service limousine company. So you’re getting a trained professional that knows how to handle a wedding and take care of the finer details. Most of our charter buses also have Wi-Fi, outlets, DVD player and restrooms. Whether you need a bus for rent or a smaller shuttle bus, M&V Limousine Ltd. will take care of all the details. You can rest knowing that your guests are take care of with the professionalism that you expect and deserve. M&V Limousines Ltd. offers coach bus rentals for schools trips, or for school sports teams. Teams such as soccer, hockey and football use our upscale coach buses. Our charter buses are also a top choice for school clubs such as ski clubs and others that require transportation for large groups whether local or long distance. We can take care of you in one of our Prevost coach buses or our Setra Mercedes coach buses. 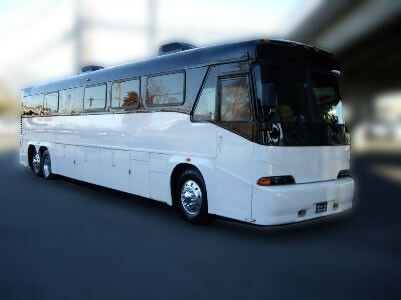 Get a coach bus for rent for anywhere in Long Island, Nassau and Suffolk Counties, Queens, Brooklyn, Bronx, Manhattan, NYC, the Hamptons as well as New Jersey and Connecticut. We have school certified drivers that are 19a registered with the DMV, drug tested and thoroughly trained to ensure your team’s comfort and safety. Also all of our coach buses are GPW tracked and monitored so that we can see where they are at all times as well as monitoring our driver’s driving habits at all times. At M&V Limousines Ltd. your safety is our number one priority! 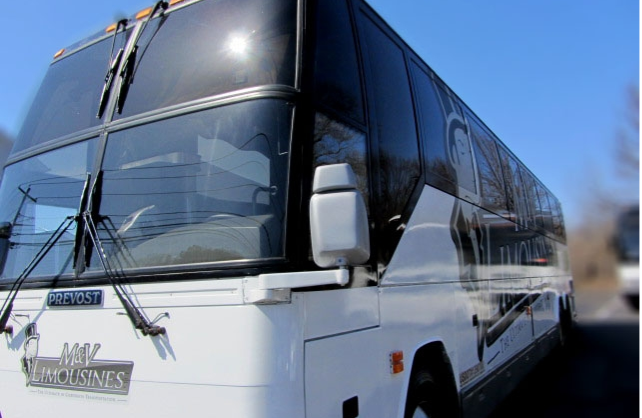 M&V Limousines Ltd. and M&V Corporate Transportation is the official bus company of many sports teams including the Long Island Ducks Professional Baseball Team. We transport the Long Island Ducks all over the East Coast in our luxury coach buses. We make sure that they reach their destinations with their coaches and equipment safely, all in total comfort, allowing them to relax while traveling before their games. Allow us to put together a free proposal for your team… and we’ll be sure to take care of you with the utmost in professionalism. Charter bus rentals are a comfortable and cost effective way to go with your group to sporting events. Head to the Meadowlands to watch the Jets and the Giants, or over to Yankee Stadium or Citifield to see the Yankees or the Mets. Many of the coach buses are also equipped with Direct TV. They also have restrooms and room to put coolers, tables, food and chairs underneath so you can have a great pregame party when you get to the stadium. Try one of our coach buses out for your next sporting event with your group of friends and associates. Our coach buses are an excellent way to travel with a large group to Atlantic City, Foxwoods, Mohegan Sun or other casinos here on the East Coast. Our coach buses hold up to 56 passengers and have all the amenities such as WIFI, outlets, restrooms, DVD players and some also have Direct TV. We can also get you many comps at the different casinos through the programs with which we are affiliated. 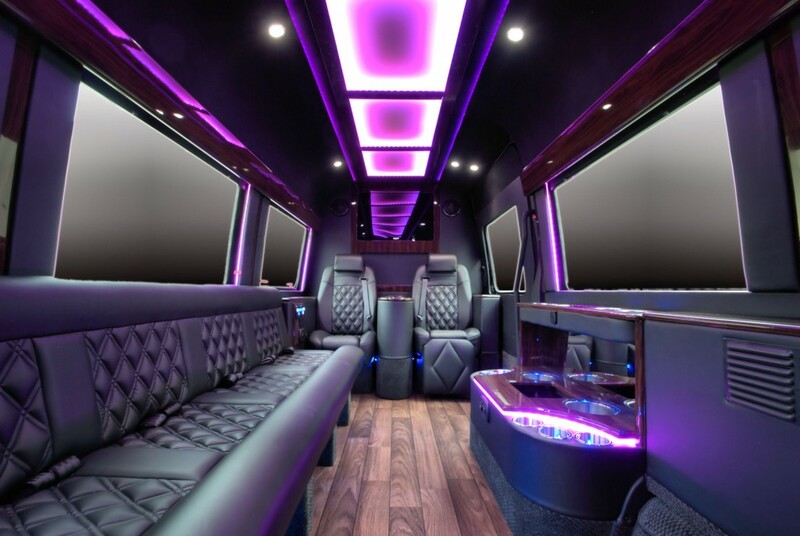 Whether it’s a corporate trip, bachelor or bachelorette party, or just for fun… you will find our coach buses an extremely comfortable, reliable and cost effective way to get there and back conveniently and safely. 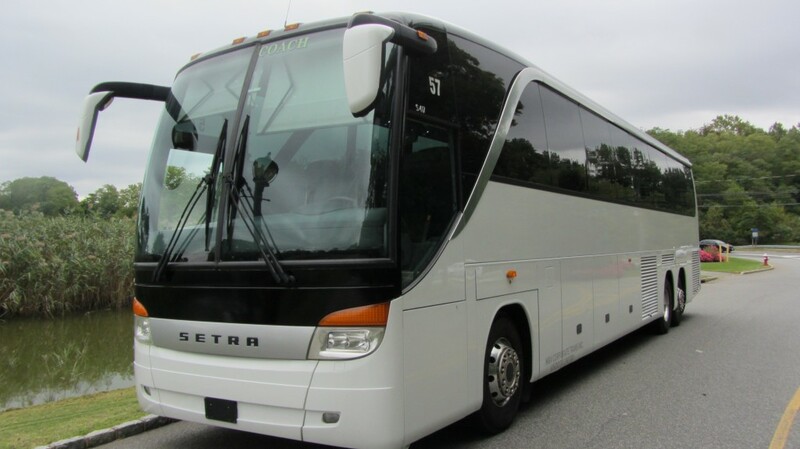 Our charter buses are top of the line, from our Setra Mercedes to our Prevost coach bus. They are equipped and set up for long distant trips. We are licensed by the US Department of Transportation and can take your wherever you want to go in the United States. If you are traveling to other states and your trip will require more that 10 hrs a day of driving time in a 24 hour period, we can set you up with relief drivers to ensure that your trip is safe, as we follow all DOT regulations. When you take a long distance trip on a coach bus you want to make sure that your coach bus company has an extensive maintenance program and that they have nice coaches to do such a trip. The last thing you want is to have a break down far from home and have your group left with a problem. When you choose M&V Limousines Ltd. to take care of you and your group, you have the peace of mind that you have nice coach buses for your trip, the best drivers and everything has been checked extensively before your trip to minimize the possibility of any issues. Our line of buses for long distance trips also have WIFI, outlets to charge your devices, DVD players with flat screen TVs and restrooms. Some also have Direct TV. There is also plenty of room for luggage in the belly of our coach buses. Be sure to plan your trip well in advance so that you can arrange for your hotel rooms, rooms for the drive/drivers if it’s an overnight trip, and any other details that need to be taken care of. Coach buses are a great way to get to the mountains when you have a large group. There is plenty of room on the bus to store your skis, luggage and other equipment that you need for your ski trip. We cater to many ski clubs and groups and are ready to take you to Hunter Mountain, Wyndham, the Poconos, and Vermont. We’ve taken our happy customers to resorts such as Killington, Stratton and Okemo. Whether it’s a day or overnight trip M&V Limousines Ltd. will get your there in complete safety and comfort. If you have a large group, getting to the airport on a coach bus may be your best option. With room for 56 passengers and all your luggage, we can move large groups with extreme ease and convenience. We will help you to plan out your trip and get you to any of the airports in the Tri-State area such as JFK, LGA, MAC or NWK. 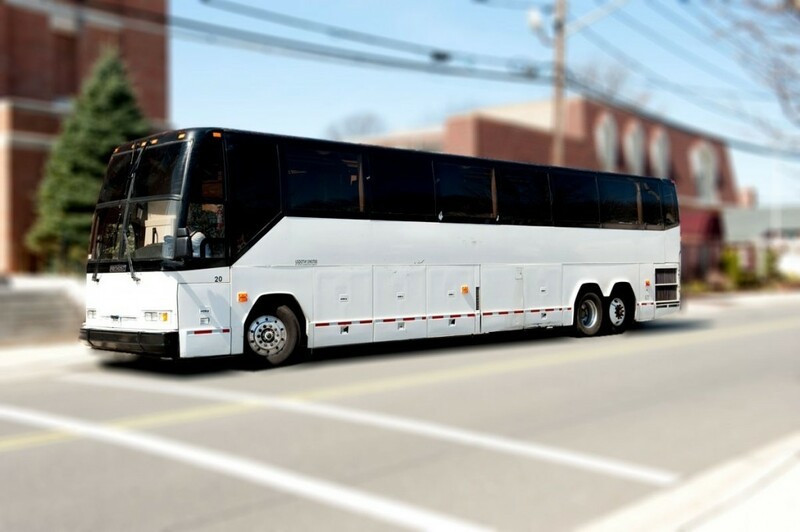 Sit back and relax and leave the driving to the professional coach bus drivers from M&V Limousines Ltd.
M&V Limousines Ltd’s coach buses are a great way to get to and from your favorite amusement parks in the Tri-State area. Whether it’s for your day camp, school or after prom day, M&V Limousines Ltd. will take care of you with the best coach buses at the best value anywhere. We will basically take you to the park, such as Six Flags Great Adventure or Dorney Park,give you 8 hours there to enjoy yourself, then you get back on our luxury coach bus to take you home safely while you enjoy, WIFI, outlets and maybe watch a movie on the flat screen TV’s. Coach buses are a smart choice for your junior or senior prom if you don’t choose one of our prom limos. It’s a cost effective way to get your group to pre-prom, and then the prom, as well as the after prom party. We have different package available to suit your needs and will take care of your with a luxury coach bus and professional driver in uniform. Q: How many people does a coach bus hold? A: Our coach buses hold up to 56 passengers depending on the bus. We also have smaller shuttle buses for between 24- 30 passengers. Q: How are the seats set up? A: The seats are all forward facing in a coach bus. Basically its like sitting with an airplane only our coach buses have more leg room. Q: Are all coach buses the same? A: No, like everything else there are different quality levels when it comes to coach buses. Just like there is a big difference between a Hyundai, a Mercedes and a BMW. Our coach buses are made from Prevost and Setra Mercedes, which are the best coach bus companies in the industry. You can see a big difference between our coach buses and those from other companies. Q: Why do some coach bus companies charge more than other coach bus companies? that everything is working for you. We pride ourselves in offering you the best value for the service we offer. Q: How much insurance do you carry? 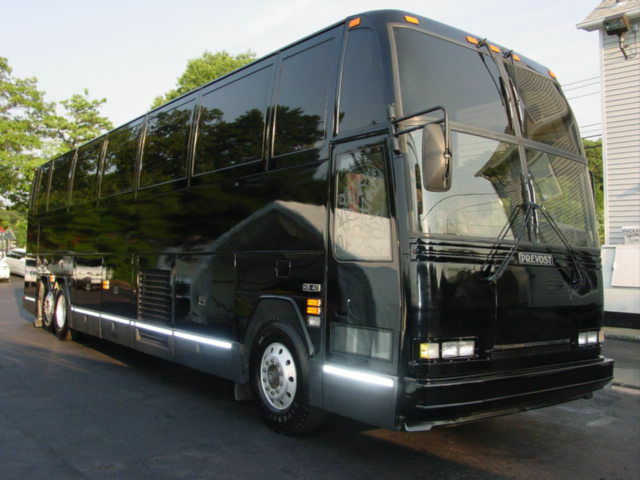 A: M&V Limousines Ltd. carries 5 million dollars of insurance coverage on all our coach buses. Q: How do you make sure the buses are safe? A: We have our own mechanics that work for M&V Limousines Ltd. full time so our vehicles are constantly being maintained and checked on a regular basis. All our coach buses also go in for PM maintenance every 3 months and DOT inspection every six months. Q: How do I book a bus for my trip or event? A: We can book your trip over the phone where you can talk with an experienced representative, you can book via email or you can book online. We typically take a $100 to $300 deposit depending on your trip and that secures the reservation for you. The balance is typically taken care of before the trip unless you are paying cash where on occasion the driver will collect the balance at the pickup location.